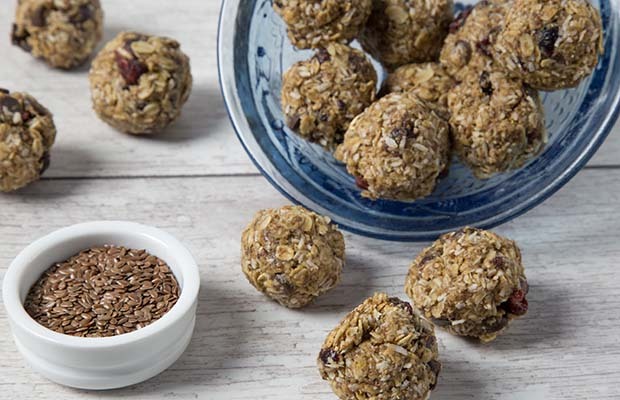 No bake energy orbs are a quick and easy snack, breakfast or dessert. Preheat the oven to 300 °F (150 °C). Arrange the oats and flax on small baking trays. Toast until golden, being careful not to burn, and stirring once or twice. Remove from the oven and let cool completely before proceeding with the recipe. Stir together all ingredients in a large bowl. You may have to use your hands. If mixture seems too dry, add 1 Tbsp (15 mL) of water. Shape the mixture into balls about 1-inch (2.5 cm) in diameter. It’s best if your hands are damp, and you may have to rinse them a few times. Place the energy orbs into an airtight container and store in the refrigerator for up to 1 week. Yield: 18 – 20 pieces. Serving Size: 1 bite. Each serving contains 1 tsp (5 mL) of flax.